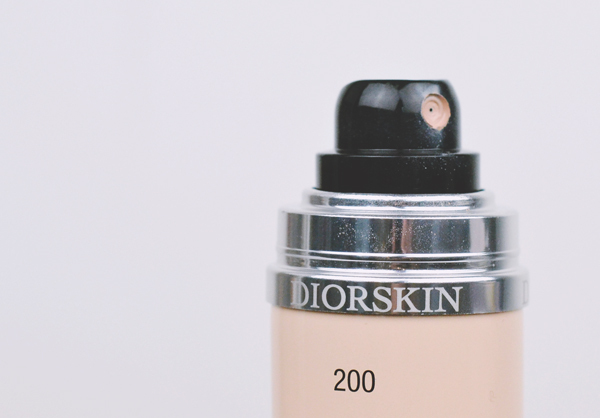 At the beginning of the year, I wrote a list of beauty brands I want to try in 2016 and Dior were high on that list, specifically the Diorskin foundations. When House of Fraser asked me to review some make up from their site, I seized my chance and went straight to the sizeable selection of Dior products to choose a foundation. Eventually, I settled on Diorskin Airflash Spray Foundation simply based on the novelty. As the name would suggest, this is a spray-on foundation. Intriguing, right? 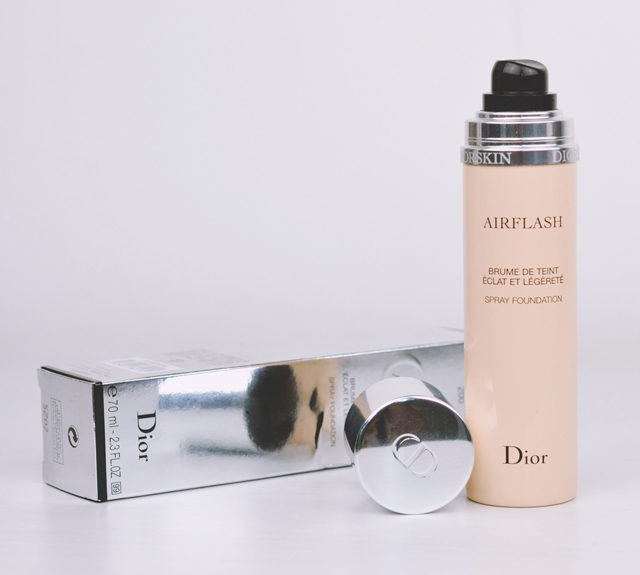 Diorskin Airflash is packaged in a small aerosol can containing 70ml of product. The can is a transparent beige shade with a super shiny chrome lid and the Diorskin logo circling the neck. When the lid is popped off, the black plastic spray dispenser is revealed. It's fairly slim but quite long so it's not especially easy to fit into a crammed make up bag. Remember those glitter body sprays you'd buy from Claire's Accessories before the school disco? This works exactly like those. Before applying, shake vigorously and then just spray on from a distance of 8 inches or so. Yes, it freaked me out the first time I did it but it was a much more pleasant experience than I anticipated. The spray feels light and has a light floral fragrance. There's none of that uncomfortable hairspray business when you have to hold your breath for 10 seconds after spraying. I'm also really impressed with how much this speeds up my make up process. In the space of two seconds, my base is applied. Perfect! The only problem is controlling the spray. Of course, it's very difficult to target where a spritzed liquid lands so it tends to collect around the hair above my ears. To counter this, I recommend wearing a shower cap and applying before putting on your outfit for the day. The other issue is that as it covers your whole face in a layer of foundation, you can't get away with skipping eyebrows and lipstick unless you want to look like an alien. Dior do say you can apply by spraying the foundation into the palm of your hand and putting it on that way but that's just not as fun, is it? The spray is very light and creates a soft finish but it's also possible to build up by going over the face again. Although it does tend to go a bit cakey and gather around fine lines if too much is applied (and this is easy to do), using a buffing brush to work the product into the face removes this effect and takes it back to a more natural finish. The unique method of spraying foundation on creates a smooth, airbrushed effect with a velvety matte appearance. It dries quickly and feels very light on my skin, soft and smooth to the touch. It also lasts hours, even on warm days. In terms of shade, I chose Light Beige (200) which is a pale, pink-toned colour. It's very slightly darker than my usual NARS Mont Blanc but the tone fits perfectly, so it's perfect for summer when my skin is a little less pale. I am very impressed with this foundation and thrilled that I took a risk. 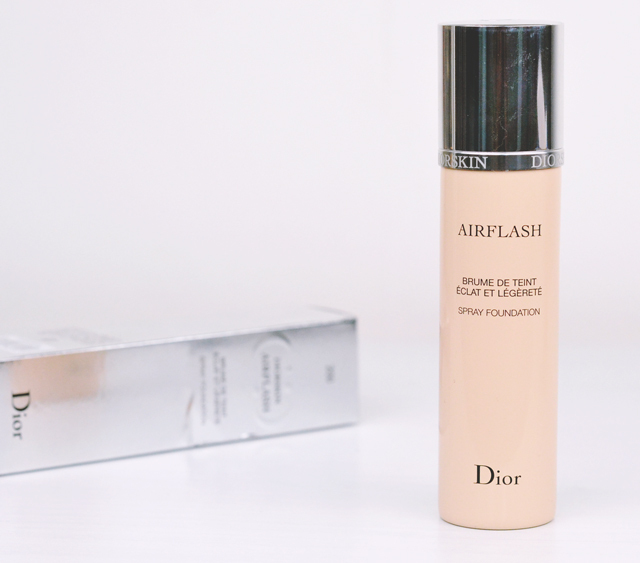 Dior also sell an Airflash CC Primer, so I might need to try that out too! I absolutely love this foundation although it doesn't keep my face oils at bay. I haven't tried many high end foundations but this one is on the top of my list. I've heard great things about this foundation. But don't you waste a lot of product when you spray it on? I can't imagine wasting Dior! Haha.